This review is a warning about the binary options scam called “Daily Income Society”. It is presented by an anonymous George. 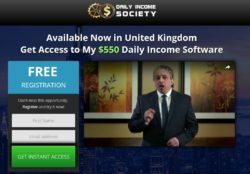 George says that he is the founder of the Daily Income Society that can give you access to a binary options trading software of the same name. 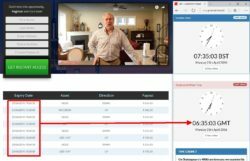 This software is allegedly making in average $550 to each member, because it can copy trades made by the management of the company. And George offers a personal guarantee, you make $550 today or he’ll pay you $1,100 in cash. Is he begging you to let him make you money?! George is a paid actor and the Daily Income Society does not even exist. These people are scammers that are getting paid for every new depositor they can refer to their broker. This is why they made up this story, they need you to open a trading account and deposit money with their broker, because this is how they make money. Their useless app will then lose your deposit in trading. As you can see the Daily Income Society presentation is completely anonymous, you won’t find any real contact information. So how would you claim the guarantee? The guarantee is of course a lie, you won’t see a single buck from these people, because they are scammers. Here is a proof. Look at the picture on the right, this is where you get after sign up. 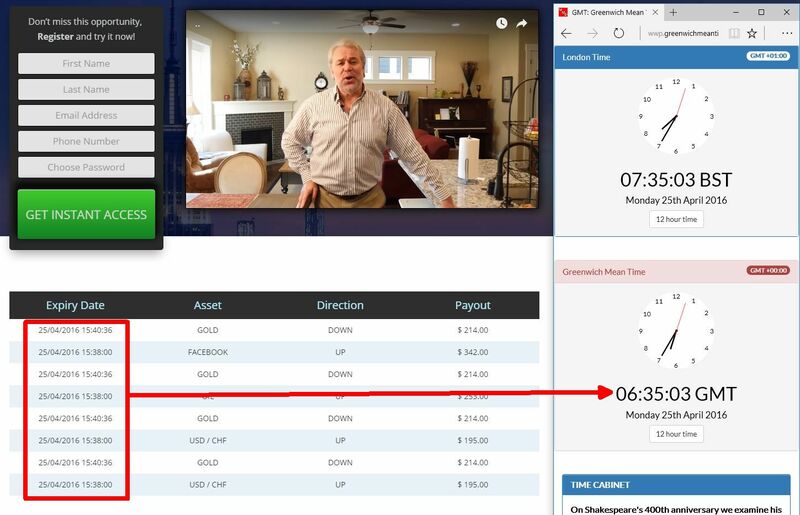 To persuade you about the performance of Daily Income Society they show some supposedly live results, but as you can see times of the trades are in the future, so these results are faked. So are all the testimonials in the video, they were made with paid actors. Daily Income Society is an average scam that needs your money, so don’t give it to them. They know nothing about trading. If you want to see how binary options trading really works, try a free demo. Then you’ll see that it is possible to make money with binary options, but you first have to learn how to trade.